Knitting Belts made in the U.S.A.
A knitting belt allows you to knit with less stress on the hands and wrists. The belt holds the needle for you! You'll be able to "throw" the yarn more easily when the working needle is supported in the belt. Some people "pick" the yarn by holding the working needle, inserting the other in the belt. What is a leather knitting belt? A "power loading" tool is included with every belt; it helps support your knitting and push your work to the tip of the needle. Shawls can be knit on more than two DPNs. Rubber needle tips will prevent the stitches from falling off the needles. thigh, hip or waist. Belts are stuffed with nylon tulle. 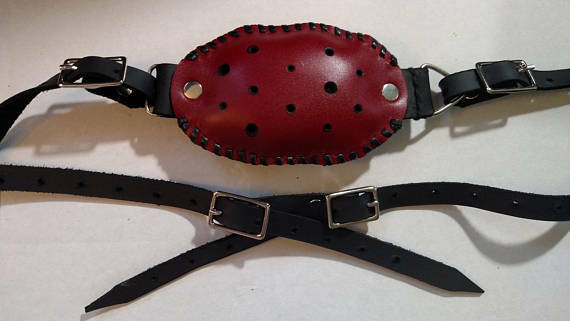 Knitting belts are leather pouches with holes, stuffing and a strap. The long double-pointed knitting needle is inserted into a hole, and the stuffing holds it at the angle you need. This ingenious tool helps people with arthritis, tendinitis, repetitive thumb injuries and other disabilities knit with less pain. New knitters often have trouble holding a needle and throwing yarn at the same time. Others have a tough time gripping the circular needles. This technique reduced my pain, and I wanted to make an affordable and attractive product that would help others.